Collagen is a vital building block of the body and it constitutes nearly 30 percent of the total protein content in our body. Collagen is a kind of structural protein which enables the elasticity, cohesion and renewal of the connective tissues of our body, which includes the skin, ligaments, tendons, bones and cartilage. Basically, collagen is sturdy and supple in nature and is a kind of glue that holds our body together. Collagen aids in strengthening the different body structures and also helps in protecting the structure of the skin. Various kinds of collagen are found in the body, however, 80-90 percent of it belongs to the type I, II or III, with a major part of it being the type I collagen. The fibrils in this type of collagen possess high amount of tensile strength. Due to this property, such type of collagen can be elongated, without being fragmented. There are various type of cells present in the tissues of the body that are accountable for the making of collagen. Such type of cells present in the body tissues are accountable for the synthesis of collagen. The amino acids and peptides form a helical structure which is strong in nature. These helical structures are then arranged into the robust fibers that give structural support to the tissues, and also provide suppleness and the property to bear strong forces. The global collagen peptide and gelatin market is receiving a huge boost due to the fact that health concerns amongst the general population of the world is increasing. In addition, owing to this, there is an increasing consumption of dietary supplements and there is a rising utilization of collagen in food and beverage sector. Also, consumers are inclined in consuming a healthy and a protein rich food and there are rising uses of collagen peptides in different kinds of cosmetics, healthcare and pharmaceuticals, which are driving the global collagen peptide and gelatin market. Moreover, with the rapid expansion of the worldwide food processing industry and the rise in the various diseases due to a sedentary lifestyle have the led the consumers to opt for buying nutraceuticals and nutritious food. Such type of foods and supplements avert diseases that occur due to old age. In addition, collagen is also used for healing of the wounds and this is a key trend in the global collagen peptide and gelatin market since the number of people suffering from obesity and geriatric population is increasing in the world. However, concerns regarding the safety of collagen peptides and gelatin and emergence of novel alternatives like altered starch gels and pectin gels among others coupled with religious constraints are the factors that are likely to restrain the growth of the global collagen peptide and gelatin market. However, increasing investments in research and developments to make plant based gelatin and collagen and the growing list of manufacturers are likely to spring up various opportunities in the coming timeframe. 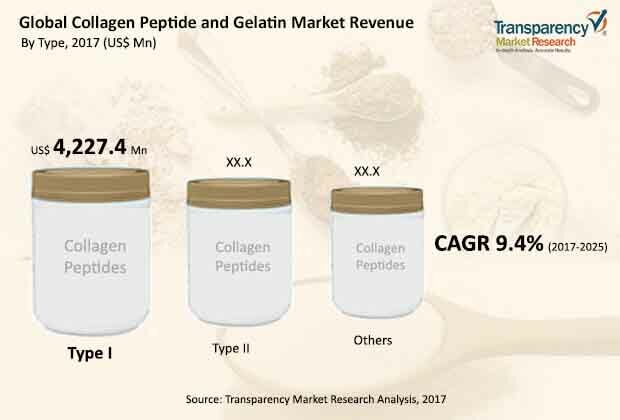 The global collagen peptide and gelatin market was valued at US$ 5,452.2 Mn in 2017 and is anticipated to reach a valuation of US$ 11,156.1 Mn in 2025, displaying a CAGR of 9.4% during the period of assessment 2017-2025. The type I collagen dominated the global collagen peptide and gelatin market. Increasing health concerns amongst the consumers and their inclination towards personal care and led to a rise in the consumption of nutraceuticals and cosmecueticals. Due to a high demand for such type of products, the demand for collagen peptide and gelatin has increased as collagen is the major ingredients for such type of products as collagen possesses anti-aging properties. This report provides in-depth region wise and country wise analysis of the collagen peptide and gelatin market. Stakeholders of this report include manufacturers of collagen peptide products, raw material suppliers, nutraceutical and cosmeceutical companies, food processing industries and new players planning to enter the market. The report provides qualitative and quantitative analysis of the global collagen peptide and gelatin market. Qualitative analysis comprises market dynamics, trends, product overview, and country-level market information. Quantitative analysis includes major players with their reported revenue, market size, and forecast for the global collagen peptide and gelatin market in major countries globally such as the U.S., Canada, Germany, France, United Kingdom, Switzerland, Spain, Japan, China, Brazil, Mexico, South Africa and Saudi Arabia. Market revenue is provided in terms of US$ Mn from 2014 to 2025 along with the compound annual growth rate (CAGR %) from 2017 to 2025 for all the segments, considering 2016 as the base year. Moreover, the report also provides volume (Kilotons) of the collagen peptide market for all the major segments from 2014 to 2025. The executive summary of the report provides a snapshot of the collagen peptide and gelatin with information on leading segments, country wise market information with respect to the market size, growth rate (CAGR %), and growth factors. Moreover, the report also includes pricing analysis and import/export of undenatured type II collagen for the major countries worldwide. The market overview section comprises impact factors such as drivers, restraints, and opportunities for the global collagen peptide and gelatin market. These factors would aid the stakeholders in establishing a strong foothold in the global collagen peptide and gelatin market. Furthermore, the market overview section comprises key industry events, product overview, market attractiveness analysis and emerging trend in the collagen peptide and gelatin market. The market attractiveness analysis provides a graphical view comparing the growth and market dynamics in various segments and country wise to identify the most attractive market. The collagen peptide and gelatin market has been segmented as by type and by geography. Based on type, the market has been segmented into type I, type II and others. Type I further segmented into fish and others and type II segmented as hydrolyzed and. Geographically, the collagen peptide and gelatin market has been categorized into North America, Europe, Asia Pacific, Latin America, and Middle East & Africa. Moreover, analysis for the major countries comprising U.S. Canada, Germany, U.K., France, Switzerland, Spain, Japan, China, Brazil, Mexico, South Africa and Saudi Arabia have also been provided in the report. A detailed qualitative analysis of the factors responsible for driving and restraining the growth of the collagen peptide and gelatin market in various regions has been provided in this section. This report also includes various ups and downs about particular country or geography that has impacted the overall market globally. The report provides a detailed outline/blueprint of the collagen peptide and gelatin market globally that will assist new companies in establishing their presence and market players in expanding their market share in the market. The report concludes with the company profile section which includes company overview, financial overview, SWOT analysis, product portfolio, business strategies and recent developments for market players.